Outdoor business signs serve as an identifier. They are a key element in the image your business shares with your community and drive the first impression many will have of your business. Let Sign Source Solution customize your branded billboards and outdoor signs in Toronto that will not only be visible to potential clients but reflect well on your business too. When your outdoor business signs are outdated, damaged, faded, or barely visible, your business is missing out on opportunities to engage with customers every single day. A professional outdoor sign, such as an illuminated pylon sign, a custom channel letters or a billboard, will work hard to build brand awareness 24 hours a day, seven days a week. Having the right outdoor signs in Toronto not only attracts more customers, but helps you stand out in a crowded and competitive market. Why not send a powerful and positive message with your outdoor business signs that let customers know they can count on you to provide them with what they need? Your signage strategy should include outdoor signage that generates greater visibility and helps you build a strong brand reputation. Imagine custom channel letters boldly displaying your business name outside your facility – this is just one option when it comes to investing in unique outdoor business signs designed to attract the attention you want for your business. Sign Source Solution can design, fabricate and install outdoor signs in Toronto that fit your business location, setting, brand and budget. Based on our knowledge and experience, we can present several signage solutions that offer options for location, size, shape, mounting method, and customization. Highlighting your company name on an illuminated pylon sign. Installing a custom illuminated sign to ensure your business is visible day and night. Using a ground sign to draw attention to your retail location. A sharp and eye catching billboard that advertising your business in a high traffic area. Posting dimensional numbers and letters to clearly indicate your building address. Adding outdoor signage to clearly indicate parking or pick up areas. If you’re interested in learning more about exterior signage or have a specific outdoor business sign in mind, such as a ground sign or a custom illuminated sign, contact the Sign Source Solution team. We love talking signs and would be happy to work with you to find the right design for your custom outdoor signs that will get your business get noticed. 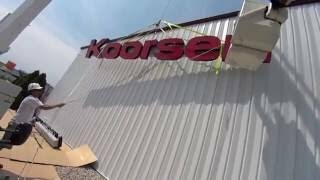 Wondering How We Install Outdoor Signs?